Butterflies and Flowers go together likes peas and carrots. The pattern is a classic look and perfect for any occasion. 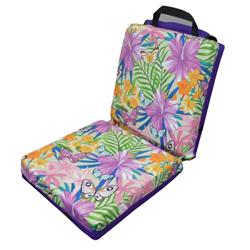 The cushions measure 13x13.5x3 inches and feature a carrying handle. The two cushions are kept together by 2.5 inches of patterned fabric.